Dr. Seuss’ “How the Grinch Stole Christmas” has become a holiday classic. Kids and adults alike love this story that features the grouchy Grinch who tries to stop Christmas from coming and enlists his dog Max in the effort. Unlike the grumpy Grinch, Max is cute and cuddly. He is the perfect dog companion, traveling over snow and mountains to do his master’s bidding, and never complaining, even when the Grinch makes him wear those stupid reindeer antlers. Max the Dog become popular after How the Grinch Stole Christmas was first appeared in 1957, but he didn’t get a story of his own until 1998. That’s when a kids’ book called Grinch Meets His Max (Wubbulous World of Dr. Seuss) was published to explain how the nasty Grinch became the lucky owner of such a loving dog as Max. According to the book, Max wiggled his way into the Grinch’s heart after the dog scratched an itch that had been bothering the Grinch. Max’s exuberance and “joie de vivre” are in complete contrast to the Grinch’s dark nature, which may be one of the reasons everyone loves Max. 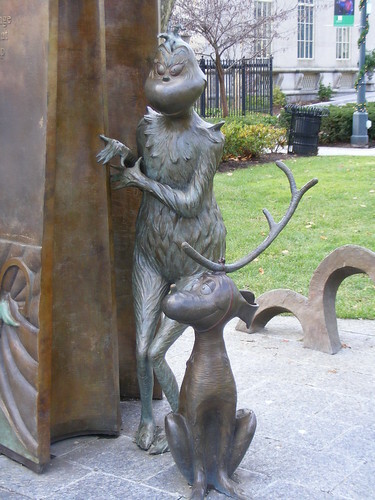 Dr. Seuss created hundreds of characters, but only a few were chosen to be immortalized in sculpture in the gardens. All of the sculptures were crafted by Dr. Seuss’ stepdaughter, Lark Grey Dimond-Cates. The sculpture garden is open to the public to visit.